A 5-month-old puppy that disappeared nearly six weeks ago is back home safe with her family thanks to a microchip. Maserati escaped from her home in City Heights in December. Her owner searched the neighborhood and put up posters but without any luck. She reported the dog lost or stolen on Dec. 21. As weeks passed by with no sign of the family dog, Candace Sallee packed up Maserati’s toys and other belongings, and put them away. Three days later, County Animal Services called. Maserati had been found. The dog was found with a woman arrested by the CHP near Dulzura on Thursday. After County Animal Services was called to pick up the pit bull puppy, the dog was scanned for a microchip and it led to the owner’s information. Sallee picked up Maserati from the County’s shelter in Bonita on Friday. She says the dog was microchipped just one day before the animal disappeared. Her friends convinced her to do it just in case something happened. “It was definitely worth doing, 100 percent worth doing,” said Sallee. 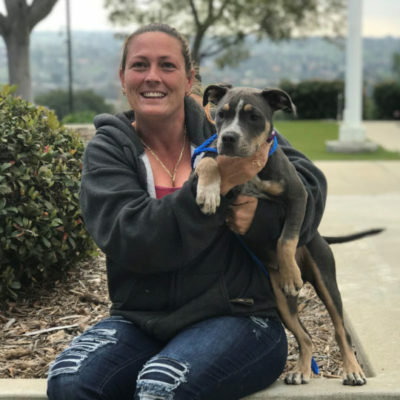 County Animal Services offers microchips for dogs, cats and rabbit belonging to residents who live in the unincorporated areas. No appointment is needed and the cost is only $10.